TAF - The Animal Fund was established in 2015 with its primary focus on the protection of dolphins and whales and is a non-profit organization run on volunteer labour. TAF is a registered Association under Monaco law since March 2015, published in the official Journal on 10th March 2015. TAFâ&#x20AC;&#x2122;s mission is to protect, save and actively help the dolphins and the whales who are victims of maltreatment, slaughter, pollution and overfishing and to educate and inform the world via publicity, campaigns, conferences and online media of the danger and consequences of cruelty and extinction. Chances for Children funds and runs an orphanage in Kampala, Uganda. The foundation houses, educates and lovingly raises 56 orphan children, that have been rescued from the streets, all affected by acute sickness and/or poverty. The children are between the ages of 4-13 years. The end goal is to build a self sustaining campus with a farm, school and all the facilities needed to provide support for the local community. A self sustaining model would mean that the campus is no longer reliant on corporate and private donors to operate successfully. Once proven successful, this model will be replicated in other countries around Africa. Located in the heart of Monte-Carlo, THIRTY•NINE is an exclusive private sports club welcoming a community of cosmopolitan members, including elite athletes, both looking for excellence. Created by Ross Beattie, an ex-Rugby International, THIRTY•NINE Monte-Carlo’s philosophy takes a holistic approach to fitness, wellness and nutrition. The Social Membership introduces an opportunity to discover club events as well as the renowned 39 Dining, a true oasis of privacy with a delicious, balanced menu. The events, both entertaining and educating, serve as chances to unwind, relax and network with a unique group of like-minded individuals. Bogali Concept is a creative company, specialized in audiovisual communication. It is founded by an enthusiastic couple, eager to achieve excellence in media projects. Lot: The production of a two minute commercial film that will highlight your assets and help to promote your company to a wide audience. Validity and conditions Gift for 2 persons. Valid from April 12th to September 30th 2019, except weekends and Monaco F1 GP. A reservation in advance is imperative and is subject to availability. On the occasion of this magnificent gala evening, Maison Vitale 1913 has great pleasure in offering as its first lot the creation of a unique and personalized piece of fine jewellery mounted with a superb amethyst of 51,90 carats. Thanks to our customized service, we propose to the highest bidder the possibility to mount this beautiful stone and realize the jewel of their dreams combining stones and precious metals, design and exceptional workmanship. *Donation includes the stone, with support and advice in the jewellery's creation with 3D rendering. The Victoria Napolitano Group offers a donation of â&#x201A;Ź20,000 as a Mademoiselle French Collection Gift Certificate. 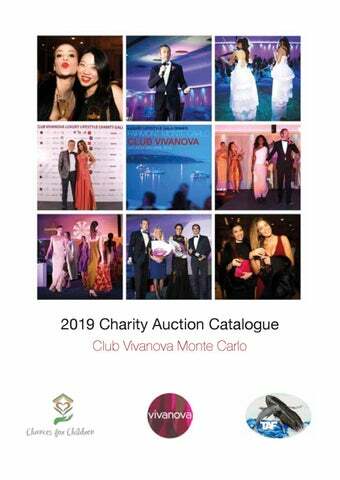 Dame Shirley Bassey, best known both for her powerful voice and for recording the theme songs to the James Bond films Goldfinger (1964), Diamonds Are Forever (1971), and Moonraker (1979), donates a pair of signed shoes for our 2019 Club Vivanova Luxury Lifestyle Gala Charity Auction. An iconic figure in the music industry, Shirley Bassey became the first Welsh person to gain a No. 1 single in January 1959. In 2000, she was knighted in the Order of the British Empire for services to the performing arts. In 1977, she received the Brit Award for Best British Female Solo Artist in the previous 25 years. Bassey has been named as "one of the most popular female vocalists in Britain during the last half of the 20th century. 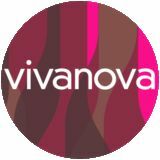 Club Vivanova and our charity partners thank you sincerely for your support and kindness! Two VIP tickets for Eric Clapton live in concert on Tuesday 4th June 2019 at the Mercedes-Benz Arena in Berlin, with complimentary direct flights from Nice, including two nights in a suite at the Sheraton Esplanade Hotel and VIP shuttle to and from the concert venue. Lot includes two Metabolic Balance consultations, including the preparing of two individual nutrition programs according to the blood values and 5 to 7 personal coaching and follow up meetings and/or online support via mail or phone. As their second lot, Maison Vitale 1913 has great pleasure in offering the creation of a unique & personalized piece of fine jewellery mounted with a fabulous ruby of 1,73 carats. Thanks to our customized service, we propose to the highest bidder the possibility to mount this beautiful stone and realize the jewel of their dreams combining stones and precious metals, design and exceptional workmanship. *Donation includes the stone, with support and advice in the jewellery's creation with 3D rendering. Three overnights for two people in a Classic Junior Suite at La Ferme dâ&#x20AC;&#x2122;Augustin on Ramatuelle Beach during any week-end (at the discretion of the hotel depending upon seasonal availability). Liné holds a Bachelor of Fine Art and since 1997, has hosted solo and group exhibitions in Danish and foreign museums, galleries, cultural centers and institutes, including France, Monaco, Germany, Iceland, Switzerland, Italy and Greece. "LUNA" - Bronze sculpture on stone. 29 cm. high (inclusive stone). Numbered and signed by the artist. Includes a signed book "Sculpture" by Liné. A whole day at Terre Blanche Hotel Spa Golf Resort***** with a helicopter flight from and back to Monaco and lunch at the Caroubiers Restaurant (Eagle menu, beverages excluded. In addition, choose of the two following experiences: 1. Terre Blanche Spa, Day Escape . Access to the Spa, including indoor pool and fitness, 60-minute massage (Specific massages excluded), 2. Two Green Fees at Terre Blanche Golf Le ChĂ˘teau Course, one of the worldâ&#x20AC;&#x2122;s most prestigious destinations for golf lovers with golf cart with GPS and full day access to the Albatros Golf Performance Center with unlimited practice balls (Eagle menu, beverages excluded). 3 nights at the Hotel L’Orologio, Florence in a Double Superior Room including breakfast. Half-day tour with lunch at Vignamaggio including private car (from Florence to Chianti and back to Florence after the tour). The Hotel L’Orologio overlooks Santa Maria Novella, one of the most beautiful and ancient squares of Florence. An elegant and contemporary 4-star hotel, with a themed décor inspired by the magical world of Haute Horlogerie. Each floor of the hotel is a homage to a maison of luxurious wristwatches: Rolex, Vacheron Constantin and Patek Philippe.